Black Truffle Sea Salt for sale. Buy online at Zingerman's Mail Order. Gourmet Gifts. Food Gifts. Black truffles from the foot of North Carolina's Sauratown Mountain. I used to think that truffles—the mushrooms, not the chocolates—grew exclusively in France or Italy and the only way to find them was to be an old gentleman truffle hunter, put on a wool vest and cap, and head out into the hills with a pack of dogs or a pig who can smell them underground. Not so. The truth is truffles thrive in many other parts of the world—and they can even be cultivated. All this I learned thanks to Jane Morgan Smith of North Carolina. Jane has about two hundred oak trees whose roots were inoculated with the spores of France's world-famous black winter Périgord truffles. She plucks them from the earth to sell to restaurants and to create this great salt. Truffles make for a mystical, magical flavor that for many is irresistable. When they're in season restaurant menus across France and Italy feature them. They're also insanely expensive. Paying hundreds of dollars for a single truffle is not seen as weird. It's considered normal. For people who want this flavor pocketbooks open wide. Nothing else will do. Nothing, perhaps, except this. Jane has mixed her Périgord truffles into salt. As they spend time in the salt they infuse it with their aroma. 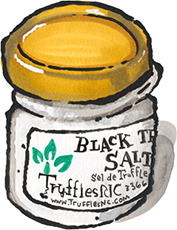 Use the salt in a dish and you have amazing black truffle flavor at a fraction of the cost. I'm normally a huge skeptic about flavored salts but this one totally works. Add it right before serving. Do so sparingly, this is strong and too much of a good thing isn't a great thing.